An elderly couple was driving across the country. The woman was driving when she got pulled over by the highway patrol. The officer said, "Ma'am did you know you were speeding?" The woman, hard of hearing, turned to her husband and asked, "What did he say?" The old man yelled, "He says you were speeding!" The patrolman said, "May I see your license?" The woman turned to her husband once again and asked, "What did he say?" The woman gave the officer her license. The patrolman then said, "I see you are from Arkansas. I spent some time there once and went on a blind date with the ugliest woman I've ever seen." It is not always wise to depend on your spouse to relay the message for you! It would be better to get a hearing aid if you have hearing problem. Saint Mark tells us that people brought to Jesus a deaf man who had a speech impediment and they begged Jesus to heal him. Hearing and speaking are two important human faculties for communication. It is frustrating when you cannot hear what people are saying. It is also frustrating when people do not hear you. Not too long after father David joined our staff as our parochial vicar, I heard some people commented that he was not very nice. He did not care when they greeted him. He just ignored them and walked away. Then I began to notice it as well. In the morning, I was reading the newspaper when he walked out to the chapel to celebrate the Mass, I said, “Good morning!” He just quietly walked by me and did not say a word. I thought, it agreed with others. It was not very nice of him to do that. And sometime during the conversation at lunch, he kept asking me to repeat myself. I felt a little annoyed and wondered, “Was my English so bad that he could not understand me? Or was he being mean to me?" He said that he had serious hearing impaired. And he was waiting for his doctor to order him the hearing aid. He also said that he usually responded but he did not speak loud enough for me to hear; then I thought, I might have hearing problem too. Most of you sitting here today might not have a hearing problem, but most of us have listening problem. It is important to distinguish between hearing and listening. Hearing is a relatively simple process. It is the physiological reception of sound. We hear the rain, the laugh, the sound of a train. After we installed the new sound systems, I could see many happy and smiling faces among you in the church, because they could hear well. The barriers to hearing can be overcome. Listening is more complex. It is the physiological reception of sound plus its psychological interpretation. The barriers to listening are more difficult to identify and overcome. It is easy to hear others, but it is more difficult to listen to others. Recently the parents of a 16 years old daughter came to see me for advice. They could not communicate with their daughter. Their relationship was so tense that they began to fear that something bad might happen. They did not want to hear the language they used in their conversation. They no longer understood their daughter and their daughter did not understand them either. They said that their daughter had been doing fine until she met this young man. Her grade began to go down. She got distracted. They engaged in bad conversations. They sent each other with text messages of sexual nature. The parents found out about her relationship with this young man; so they wanted to prevent their daughter from him. They forbade her to communicate with him. She did not want to stop. So the arguments continued on. Both parents were not happy; and their daughter was not happy either. They heard each other, but they were not able to listen to each other. In order to listen to each other, they need to pay attention to their psychological needs as well. The parents have their psychological needs, and their daughter also has her psychological needs. They love each other, but if they don’t know how to respond to their psychological needs, they would not be able to understand each other. The parents love their daughter. They want her to do well in school. They want her to be successful. They want her to be happy. They are afraid that their little girl would go down the wrong path. And the daughter also loves her parents. She doesn’t want to hurt them. She doesn’t want to disappoint them. But she is also growing and becoming a woman. She begins to see the change in her thinking and the feelings in her heart and her body. Suddenly there is a young man who becomes another significant person in her life beside her parents. She has a special feeling for him that she never had toward anyone like that before. And now her parents are forbidding her to feel that way; it is impossible! She disagrees. The young man is attending first year in college. So I recommended the parents to talk to him and invite him to their house and have an adult talk. Ask him to work with them to help their daughter to concentrate on her studying. Make him an ally to work on their daughter, if he really cares about her. They were afraid to take my advice, but they said they would try. I hope it works, because I have not heard from them again. Are you able to listen to your spouses? A woman wrote to Carolyn in the column:“Tell Me About It”: “How do you know it’s time to end a marriage? I’m not at all attracted to my husband, the result, I think, of his preoccupation with work and just an overall lack of physical chemistry. We’ve got two young children, and many would say I’m lucky, but the idea of spending my life in what feels more like a business relationship than a marriage breaks my heart. Am I crazy to think of leaving? Many problems, tension and broken relationships happen because people are not able to listen to one another psychological needs. We are invited to be “open” to one another and to God today. Many of us have heard God’s words speaking to us. We hear God’s words every day and every week, but most of the times, we are not listening. God puts us in this earth planet to know him, to love him and to serve him so that we can be with him eternally in heaven. But look at what we are doing. We want to look for life in the moon. There is no life in the moon; so we go to mars to look for life. There is no sign of life on the Mars either. Our government and scientists continue to support looking for life somewhere else in space and supporting and promoting abortions, killing human life here on earth. We are still deaf to life; we are still deaf to God. We are deaf in many different ways to one another. Hearing and listening symbolize openness to God. 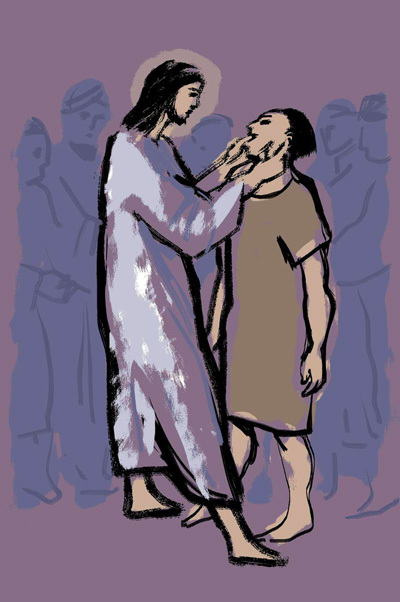 Jesus touches the ears and tongue of the deaf man and cures his deafness. The man now can hear and he goes about to proclaim the good news of Jesus Christ to the world. We pray that God opens our eyes to the reality of God’s presence in our midst in the goodness of people and in the tenderness of life. We pray that God opens our ears to hear the words of God spoken to us by others revealed to us through the created world. We pray the God will open our ears to we can hear his words and direction to true life, true liberty and true happiness. Touched by Jesus this way, our hearts leap with joy; our world and our lives are charged with the presence of God. We go out to proclaim the good news of Jesus Christ to other as well. We go out and say, “God has done all things well. He makes me hear and speak!” God is the source of our life; God is the spring of our happiness, and God is the reason of our liberty!